The DeWalt 20V MAX metal cutting saw includes a 5 1/2-inch 30T carbide tipped metal cutting blade that quickly and cleanly cuts materials such as strut, threaded rod, conduit, cold rolled pipe and metal plate. This saw is designed with a powerful 460 MWO, 3,700 RPM motor that delivers power and speed to make the most demanding cuts with total ease. The New! Renowned EC-617 Excalibur by General International design expertise now available in CNC technology. FlashCut CNC is the only Windows CNC solution offering a dedicated CNC controller ensuring smooth and uninterrupted motion using 32 or 64-bit Windows 10, 8 or 7 with a USB connection on a laptop or desktop computer - includes phone and e-mail support. The innovative Spindle speeds up to 24,000 rpm with automatic spindle on/off control helps create precise and efficient cuts. Includes a steel stand and built in dust collector. 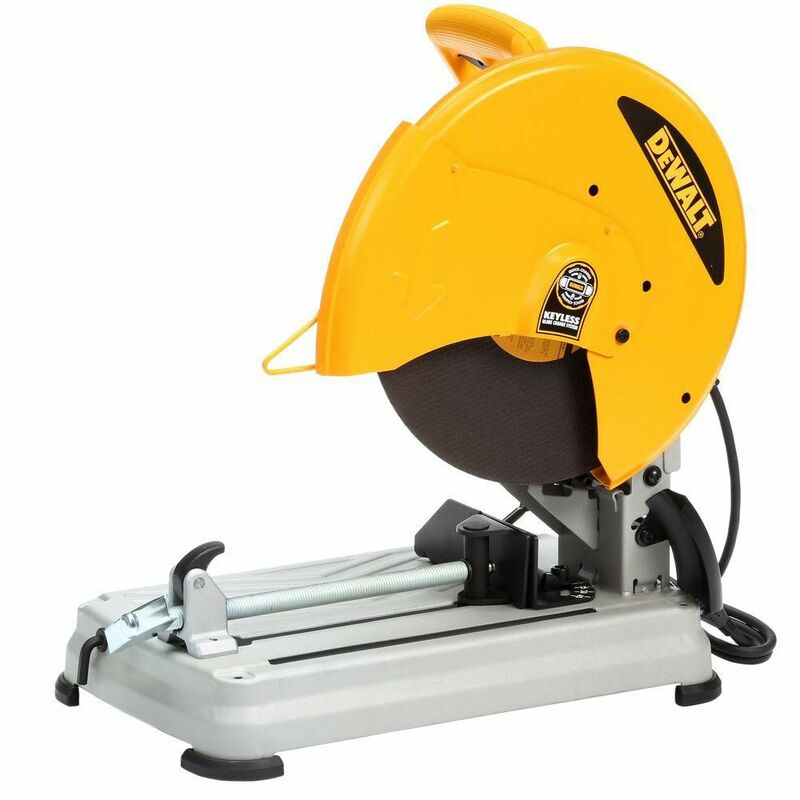 14-Inch Cut-Off Chop Saw With Quick-Change Wheel Release Featuring the innovative Quick-Change Wheel Release technology, the DeWalt 14-inch Cut-Off Saw provides power and overload capacity to maintain performance and durability on the industrial jobsite. It has an extra-wide, solid steel base that offers stability when cutting longer materials and it includes a 6 ft. cord for extended reach capabilities. 14-Inch Cut-Off Chop Saw With Quick-Change Wheel Release is rated 4.1 out of 5 by 89. Rated 2 out of 5 by John from Gets the job done, but that's about it. Not real... Gets the job done, but that's about it. Not real precise. Rated 3 out of 5 by Anonymous from Doesn’t worked what expected.... Doesn’t worked what expected. Rated 4 out of 5 by fireplug22 from well so far it's doing the job for now. Just wish I could the right cutting wheel for it. Other t... well so far it's doing the job for now. Just wish I could the right cutting wheel for it. Other then that it work fine.